Skunk2 Billet Oil Caps are precision CNC machined to be lightweight. Designed specifically for the 05-06 RSX, direct bolt on. The PIAA XTRA series bulb output a brilliant Xtreme cool white beam similar to the H.I.D. color of the headlight of some new luxury cars, and the output brightness of the PIAA Xtreme White series bulb is up to 2 X brighter than standard factory bulb equipped on most cars today. This is for ONE standard Size piston! Â Â Â Made by DOT/SAE approved and certified manufacturer to ensure quality & fitment. 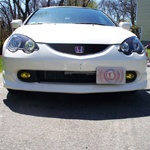 Â Â Â Complete fog light kit. No additional hardware or harness needed. Â Â Â Direct Replacement, All Wiring PreAssembled. Please note this item is special order.